"Anemone, blackberry, crab, Douglas fir, eagle...this elegant alphabet book mirrors the natural wonders of the Pacific Northwest. Except for the double-page spreads 'A for anemone' and 'Z for zephyr,' each Northwest entity is allotted one gift-card-perfect page, showing the capital and lowercase versions of each letter. The artwork resembles woodcuts, but Viano carves away black paper to shape her images. A soothing palette--creams, robin's-egg blue, pale greens, warm rose--sets a reflective mood in keeping with the quiet, still illustrations of close-up objects and landscapes alike. . . Much of the pictured flora and fauna, such as gull, lichen, nettle, pine cone, queen bee, etc. can be found elsewhere around the world. The author embraces her Northwest-resident status, using inclusive language like '[o]ur beloved ISLANDS' and extending her conversational tone with friendly admonitions such as 'Blame the squirrel for the falling PINECONE that hits you on the head while you rest against a tree.' Urchins and volcanoes and whales, oh my! This eye-catching alphabet book affectionately showcases the Northwest's bountiful beauty." "Teach kids to read the Northwest way with S is for Salmon...a new alphabet book by Seattle artist Hannah Viano, featuring gorgeous paper-cut illustrations of local flora and fauna." ". . . this quintessential alphabet book for Northwest kids brings together gorgeous paper-cut artwork with pages dedicated to all that is living in the Northwest—L is for lichen, M is for morel, O is for octopus—in a way that celebrates the beauty of our home and everything that makes it unique. . . This book is perfect for the little (or big) explorer in your family." "Beautiful paper-cut illustrations highlight Northwest flora and fauna, from B for blackberry to R for rhododendron. Muted pastel colors accent the pictures, created by cutting away black paper. A sentence per page offers a bit of child-friendly information, such as 'Horsetails are 100 million years old and still make the best pretend swords.'" "Here's a cute little book that teaches the ABCs Northwest style! 'S is for Salmon' by Seattle artist Hannah Viano is fun to read and pretty to look at. Beef up your Northwest vocabulary with words like: anemone, morel, lichen, horsetail and more." "If you have ever been on a hike in the Columbia Gorge or gazed upon majestic Mount Hood, then you might agree the Pacific Northwest is a magical place. Hannah Viano perfectly illustrates this magic in her debut children's book, S is for Salmon." "Pacific Northwest artist Viano uses a paper-cut style—an art involving cutting from a sheet of black paper—to illustrate this striking alphabet book with images of plants and animals from the coasts and forests of the Cascadia region. Featuring 26 full-page illustrations (colorized lightly) this book will delight young readers and adults alike." 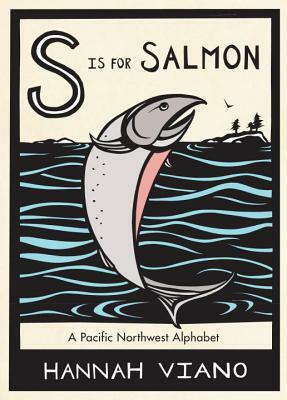 "S is for Salmon is a striking, elegant alphabet book for families in the Pacific Northwest (and beyond) that expands young readers’ vocabularies and tickles the fancy of parents reading along. Author and artist Hannah Viano created the enchanting Pacific Northwest alphabet book out of gorgeous paper-cut art. The bold artwork contrasts thick black lines with soothing colors to create an alphabet book that’s distinctive and eye-catching, yet peaceful enough for reading aloud together at bedtime... S is for Salmon should quickly join the ranks of other popular souvenir books for families visiting the Seattle area, like Wheedle on the Needle or Larry Gets Lost in Seattle. It’s the perfect gift if you’re looking for something special to give friends and relatives visiting this rainy spring. It also makes a great baby shower gift for local parents. Flipping through the pages will effortlessly bring back memories of a relaxing vacation to the Pacific Northwest or, in my case, motivate local parents to head outside and explore the natural life in their own backyard." "Viano's compositions convey our region's flora, fauna and geography with pleasing simplicity and her written definitions are a nice combination of natural history and whimsy." "Author and illustrator Hannah Viano’s S Is For Salmon is not your typical ABC book. It is fresh, the artwork is excellent and every kiddo practicing their ABCs should have a copy of this beautiful book." "Throughout the pages of S is for Salmon, your child’s imagination will take in the bold block prints, exploring the native species that fill the forests, rivers and meadows of Washington State and its neighbors . . . From salmon to trillium, lichen to zephyr winds, you will never be bored in the Northwest and we have our own ABCs to prove it." "S is for Salmon is not only informative, but highly appealing and engaging, which will provide preschoolers and young elementary school children a great stepping stone toward higher level text." "There are plenty of alphabet books out there—so many that you can afford to be pretty picky when choosing which titles to check out from the library or purchase and add to your child’s personal home collection. . . recently I came across a stunning and unique new alphabet book, Hannah Viano’s S is for Salmon: A Pacific Northwest Alphabet from Sasquatch Books; this is one I can’t stop looking at, and it’s become a new favorite of mine." ". . . a gorgeously crafted, hardcover alphabet book that showcases natural elements like humpback whales, and bald eagles with [Hannah Viano's] vibrant, handcrafted illustrations."